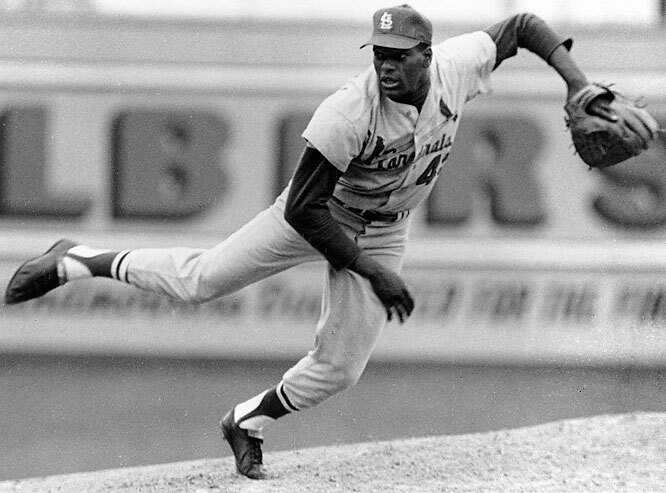 We’ve heard Bob Gibson’s name a lot in the past couple of days, leading up to the announcement of the National League MVP yesterday. Clayton Kershaw of the Dodgers became the first NL pitcher named the Most Valuable Player since Gibson in 1968, with each winning the Cy Young Award also. It’s always amazing to look back at Gibson’s stats from that year. The most incredible, and likely most well known, is the 1.12 ERA. Looking at his game log from 1968, the highest ERA he had at any point was 2.35 — on April 20, after his third start of the season. It was 0.96 after starts on July 25 and July 30, and was 0.99 on Sept. 2 after his 10th shutout of the year. In that 10th shutout, a 10-inning 1-0 win over the Reds, he pitched all 10 innings and allowed just four hits. Speaking of shutouts, he had five straight complete game shutouts from June 6 to June 26, allowing 21 total hits in those games and striking out 35. He walked five, but none in two of the games. Let that sink in for a moment. Five straight complete game shutouts. His record, which probably also is familiar, was 22-9 — and it’s the number of losses that’s so surprising. But two were by scores of 1-0, one was 2-0 and two were 3-2. He won 15 consecutive games between June 2 and Aug. 24. There were only three games all season in which he had no decision, including his first two starts of the year. Then there was the 1968 World Series when the Cardinals faced the Tigers. Gibson started Games One, Four and Seven, throwing complete games in each. Behind Gibson, the Cards won Games One and Four, losing Game Seven and thus the Series. Back to Game One. Perhaps you’ve heard about the record he set that day, since it’s still a record today — he struck out 17. Here’s a look at each. Nothing like watching a little bit of that heat to get you through this November polar vortex, right? And if you have some time and want to watch all of Game One, it’s available to watch here. This entry was posted in General Cardinals and tagged Bob Gibson, Hall of Famers, NL MVP by Christine Coleman. Bookmark the permalink.